It kind of looks like the Ant Queen's mask. oh my f*** god! that is beond awsome!! How is breathing undernethe that thing?? difficult? This is a very impressive piece. I love the way the leather turned out. where did you get some of the supplies, such as the brass parts? I get most of my supplies from local pawn shops. But you can try other places as well. eg. welders, fabricators, schools etc. I am most impressed with this one. It's nice to see a mask again! It looks very well made. I'm stoked about this one! AWSM! But! It would be better is you would cover the hose with a thin leather layer. And I think it needs some copper tubes. But it looks great. lol, be careful there dangerous! woah!! that's very very cool!! 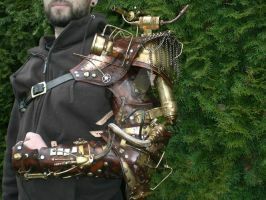 Thats pretty awesome, reminds me of a steampunk kamen Rider. Now that you say it... Yes it does!